Keith Haring had a brief but blazing life. Although exuberant and indefatigable by nature, he succumbed to AIDS before the age of 32, but in a short career that spanned little more than a decade he produced a voluminous, pulsating body of work. The act of art-making allowed Haring to formulate a visual universe that gave meaning to his emotional life. Enamored of television, film, and photography, Haring understood how these media might be employed as recording systems and creative vessels for his practice. As he submerged himself within the overlapping social and artistic worlds of New York City, Haring used photography extensively to document his practice and help forge his personal and political identities. Drawn to the energy of graffiti art and the propulsive beats of hip-hop culture, Haring made tags and drawings on the surfaces of a medley of public spaces, including advertising billboards, scaffolding on construction sites, and the pavement. Some of his earliest street works were collages composed of cut-up headlines from the New York Post that were cheaply photocopied and pasted up on walls and the bases of lampposts, guerrilla-style. Riding the subway to and from his apartment uptown, Haring noticed a more explicit opportunity in the form of expired advertising panels in subway stations that were temporarily covered with black paper, waiting for the next poster to be added. Between 1980 and 1985, despite multiple fines and an arrest for “criminal mischief” in January 1982, Haring made thousands of chalk drawings on these subway “blackboards,” creating inventive compositions that radiated with energy. The execution of each drawing was a performance, carried out with speed and assurance in the moments before a train arrived at or departed from the platform. The rapidity of their creation made for distinct, instantly recognizable imagery and a vocabulary of explicit forms that includes barking dogs, radiant babies, pulsing TVs, zapping spaceships, and amorphous, multi-limbed figures. Though on the surface the drawings may appear childishly simple, they were conceived for immediate audience readability. The sheer volume of the drawings distributed throughout the subway system had the power of a mass-media campaign, even if individually they were ephemeral and fugitive in nature, easily erased or pasted over with an incoming advertisement. 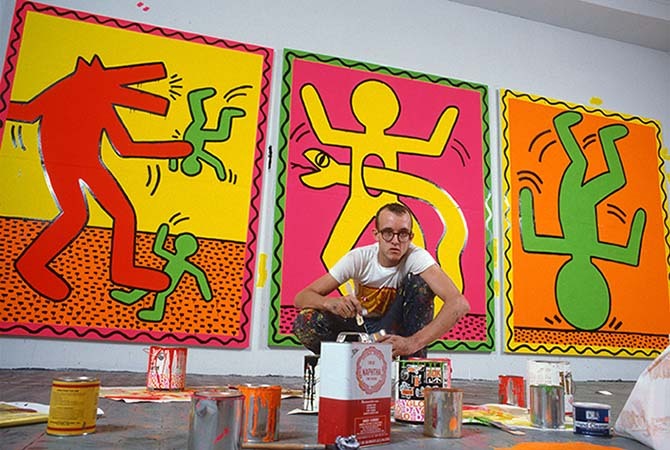 In the 1980s, public art was encouraged and funded, enabling Haring to expand his practice and his social reach by taking on a range of endeavors. Under public auspices, he often worked closely with children, wherever possible involving them as participants and collaborators in his site-specific workshops and public art projects. 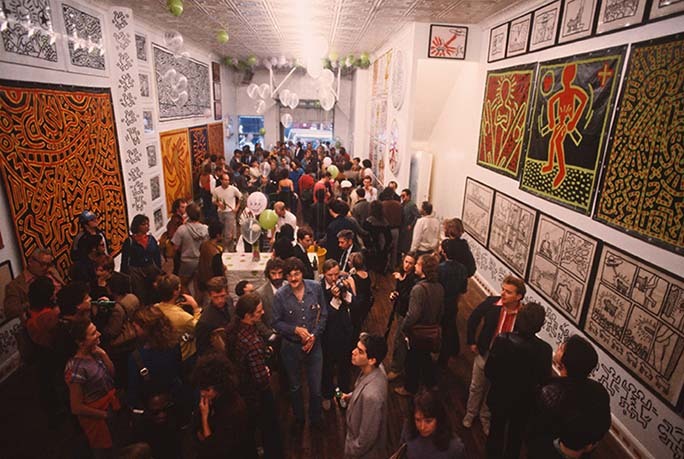 On a single day in December 1985, Haring completed a monumental 70-foot-long mural composed of 24 panels for the gymnasium at the South of Market Childcare Center in San Francisco (also known as the Saint Patrick’s Daycare Center), a facility serving preschool children and their families. One of 16 such public works painted at hospitals and children’s centers during his lifetime, the mural is full of playful kinetic energy, with dancing twoheaded figures, grinning alligators, a frog prince, and a self-portrait along the right border with Haring shown waving at the viewer, paintbrush in hand, with his patch of curly hair, rounded glasses, and trademark Nike sneakers. The work remained in place until 2006, when the center was forced to relocate to other premises in the city. The verve and physicality of Haring’s art-making were well matched with his desire to create work with a public purpose. He taught himself to execute ambitious compositions with tremendous focus and speed, a skill that could be equally well deployed in the studio or on the street. He reveled in the performative aspect of his practice, channeling his physical strength and imagination to produce art that met his expectations for personal liberation and a full embrace of life. Even as he confronted his failing health and the onset of his premature death, he retained an ardent belief in the power of art to vivify and transform at a truly public level. Excerpted from Julian Cox’s essay “Introduction: Social Justice and Public Display” in the catalogue Keith Haring: The Political Line. Cox is the founding curator of photography and chief administrative curator at the Fine Arts Museums of San Francisco. He is curator of the exhibition Keith Haring: The Political Line at the de Young, in collaboration with guest curator Dieter Buchhart. Want to read the full essay? Check out the Fine Arts Museums of San Francisco exhibition catalogue here. Visit The Keith Haring Foundation website for photographs and quotes by and about Haring. Learn more. Check out the Fine Arts Museums of San Francisco catalogue for an in depth look at Keith Haring's life and work. Learn more.